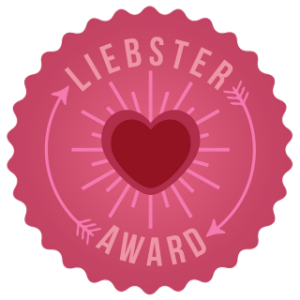 Thank you very much to Paper Cuts Reviews for nominating me for the Liebster Award. It is an award passed on by bloggers to new blogs worth reading (blogs with less than 200 followers). It’s very exciting to be nominated, and in turn to nominate others! ANSWER THE QUESTIONS THAT WERE ASKED OF YOU (BY THE BLOGGER THAT NOMINATED YOU). I have waaayyy too much canvas’s in my bedroom. I can’t drive. All my friends ship me around. Green is my favourite colour. Like I will EAT green sweets, buy green things, etc because they are green. My Kindle is literally my baby. I’m addicted to Strawberry Splits. I am an earring hoarder. Okay, that’s my 11, very boring facts about myself. This is really hard because I don’t really idolize anyone, well maybe my mum. She’s one of my best friends. Hmmm, I was at Butlins with all my family (Grandparents, aunt, uncle, cousins, mum, brother) and going on the cable car with my dad. We went over the top of my family and i was shouting and waving at them. Ohh how to be 3/4 years old again. Okay so there are waay too many too! But McFly and Paramore. I’ve followed both bands from the very start. If you had to eat one food for the rest of your life what would it be? Holy smokes…umm probably pepperoni pizza and garlic and herb dip. Obsession. You’re deserted on an island somewhere and have 3 celebrities with you, who are they? AHH Umm. okay, let me think about this. It’s really hard. Well, I’d need another girl with me, so Hayley Williams (Can teach me to sing like her). And the boys would be Greg James (He can bring along his DJ stuff) and Channing Tatum (He can do the chair dance from Magic Mike that Karli so very told me about last night ;)). 2 Americans and Two Brits. Sorted. In RL or online? RL was last night, my mother and brother. Online would be my honeybee, Karli. This changes all the time but atm its The Mindy Project. “If you don’t look, it will come to you.” – Probs not the right quote, but whatever. “Your time will come”….And it definitely has :). I dont really have advice given, I’m normally the one dishing it out. What made you start reading? If you could elsewhere, where would you go? Top three books you;d take if stranded on a desert island? Congrats Zoe, you deserve it! I am keeping my fingers crossed for you!